The Getty Center is a modern design by Richard Meier in a picturesque hilly site in Santa Monica Mountains in California. It is a composition of buildings brought together in coherent unity in a language that flows, contrasts itself and further regenerates into fantastic forms as one moves through the site. It explores a variety of design principles from varying textures and geometry that capture interest at every point of the complex. 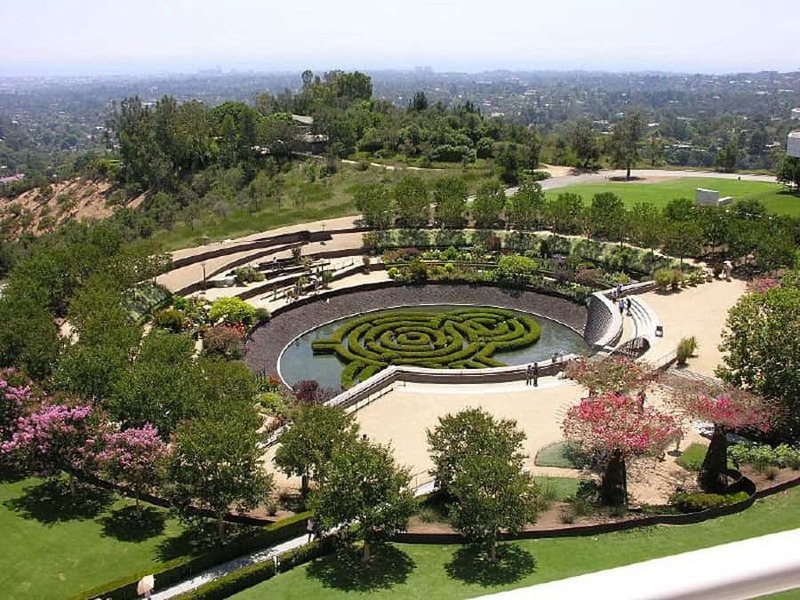 The combination of gardens, open spaces and built structures comprises the J. Paul Getty Trust – a museum, a million-volume library, reading rooms, study carrels, a 450-seater auditorium, offices and other educational facilities. It has a radial organization focusing around the central circular building – the library. Smaller pavilion buildings, connected by green landscaping, break down the scale of the museum experience, allowing for pauses and encouraging interplay between the interior and exterior. Its masterplan is spread out to allow the users to experience the landscape as a transition between spaces. It carefully links spaces and creates a sense of place, privacy and at the same time deliberately creates common spaces characteristic of educational institutions. Views from the center are breath-taking, showing disparate aspects of Los Angeles landscape – the Pacific Ocean, the San Gabriel Mountains, and the vast grid of the city. These views inspired the architect to design a complex that highlights both nature and culture. The extents to which this location’s genius loci influences the design is made obvious in the placement of openings and transition spaces between indoor and outdoor. The design has a deliberate spatial organization that maximizes on the specifics of this natural surrounding. From the south, the center emerges from the 110 acre hillside. Two computer-operated trams elevate visitors from a street-level parking facility to the top of the hill, providing a fantastic rising experience with unfolding views. While indoors, the views are further maintained through curtain walls placed in respect to the surrounding landscape. A circular building to the west houses the Getty Research Institute (GRI). Its library evokes the introspective nature of scholarly research, with book stacks and reading areas wrapping around a central courtyard. The library itself is not centralized, but organized into a series of smaller sub-libraries whose open plan encourages scholars to explore incidental areas in the open stacks. Its curvature expresses the Center’s introspective and analytical nature that has endless possibilities. The stone cladding is the most remarkable element of the complex. It is beige colored, cleft-cut, textured and fossilized travertine that reflects the bright Southern California light. In produces sharp reflections of the morning sun and honeyed warmth in the afternoon. Its natural texture allows it to form a close and harmonious relationship with the greenery while at the same time acknowledging the contrast that exists between the built form and the natural form through its colour scheme. The Italian travertine used to clad the buildings blends in with curvilinear design elements and natural gardens. This kind of cladding is associated with public architecture and expresses the qualities that the center celebrates: permanence, solidity, simplicity, warmth and craftsmanship. The center boasts of natural lighting through its exterior glass curtain walls that allow the sunshine to illuminate the interiors. Computerized louvers and shades are used to adjust the light that penetrates indoors. Paintings in the museum’s upper level receive natural lighting but are protected against damage by sunlight through special filters. Exterior courtyard spaces include fountains and variety of trees like Mexican cypress and the cactus garden to the south. These spaces, together with terraces, glass walls and open floor plans provide fluid movement between indoor and outdoor space and maximizes on views for the Getty staff. Throughout the campus, numerous fountains provide white noise as a background. These outdoor spaces, the views over Los Angeles and the careful selection of stone cladding all form the success of the design of this facility.